Happy Monday and Happy Columbus Day Holiday if you celebrate it in your corner of the world. Columbus Day commemorates the arrival of Christopher Columbus in the Americas in October 1492. You know those Americans....any opportunity to party, even on a Monday, eh? Congratulations to Casie who won the Rafflecopter drawing at the 5 Girls Book Review site for the e-book for inspiritng and empowering girls, Girls Succeed! Thanks to all who entered. You're all winners to me. The blog hop for the Insecure Writers Support Group was fantastic last Wednesday. I enjoy this once a month tradition for writers to get together and share their insecurities. Writers insecure? You bet! Find out more about joining the group by clicking here for my IWSG post. Having a good time meeting authors at Books We Love. Here's my official author page at BWL. If you have a chance, pop over and check out the books. Something for everybody there. When a kitty/cat snags her claws into your sweater or fabric, do not pull the cat away from you or pull the cat down. Always pull the cat up to avoid causing a huge snag. New word in the writing world for me--prolixity. According to my Kindle dictionary, the word means using "too many words, tediously lengthy". I found this word in Bill Roorbach's excellent book on memoir writing, Writing Life Stories. Do you know you can easily find the definition of a word when reading on a Kindle? Place your finger on the word in the sentence and the definition pops up. So easy and helpful. I usualy highlight the word and make a note so I can find it again. I enjoy learning new words. I guess 'cause wordsmithing is my job. In case you're thinking about writing a memoir, click on the book cover below for more information about Bill Roorbach's book. I love your page at Books We love, JQ. What a great-looking site. I'm very excited about release of your next book! Congratulations again, and I hope you enjoyed Columbus Day. Thank you ,Helena. Columbus Day was a day of travel. Thank you so much for stopping by. Hi Anna, Glad you enjoyed the tips. Thank you. Hey, JQ. Sorry I missed this earlier. I've been deep in edits and only come out now and again. :) I mention Columbus Day on my blog post on Sisters of Suspense tomorrow. Love your new publisher. Easy to navigate the website and I love your page. They have a good number of romantic suspense books, too. I'll share. Congratulations, J.Q. on your new books and BWL. I will check out your author page as soon as I'm done here. Thank you for the tips. Are you in Florida through the winter? Hi Marsha, no need to apologize. I know how those editing days go. We were on the road all week, so I just checked the page yesterday. I'm excited to be at BWL. Glad you liked the site. I'll check out your post tomorrow. What a great opportunity for you to promo your books together. Hi Susan, Thanks for your congratulations. I didn't think I'd ever be as excited about a book launch as I was for the first one. But I'm giddy about this one. Hope you can use the tips too!! Yes, we'll be here all winter. Getting settled in today, but cannot get used to the 85 degree heat here after Michigan fall weather. I'll acclimate soon. !! I LOVE the idea behind your book. Such an important message. As for Columbus Day, it's kinda controversial. Columbus wasn't a good guy, I'm hearing? When I worked for state government, we always gave up Columbus Day as a holiday so we could have the day after Thanksgiving off...Black Friday isn't an allowed state holiday unless you do some kind of switch. They had us vote every year for a decade or so and finally they just started making it automatic! I asked someone why we didn't give up the November holiday and they said Columbus Day is insignificant but Veteran's Day is very important. I agree...just thought it was odd that we have a holiday on the calendar that nobody really thinks matters (except the post office and banks!). Hi Stephanie. 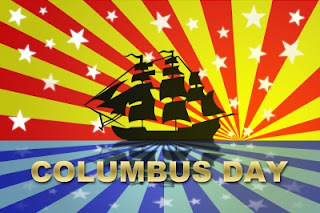 Interesting to know about your experience with the Non-holiday Columbus Day. I heard rumblings for the first time this year and that states have dropped it in preference for a Native American celebration. Columbus is a bad guy cause he killed so many of them. Thanks so much for you kind comment on my book and for stopping in to leave a comment.